Current guidelines advocate the use of R.I.C.E., the acronym for Rest, Ice, Compression and Elevation, for patient self-management of soft tissue injury. The purpose of this study was to investigate the efficacy of R.I.C.E. applied as part of patient self-management compared (R.I.C.E.) to R.I.C.E. incorporated with multimodal physiotherapy management (Physiotherapy). A randomised control trial was carried out in a Physiotherapy Clinic. Twenty eight participants with an acute ankle sprain were randomised into either R.I.C.E. (n=12) or Physiotherapy (n=16) groups. Pain, function and swelling for acute ankle sprain patients were recorded on Days 1, 3, 7, and 11 post injury. Medication usage was also recorded. The main findings of the study were that pain and swelling reduced significantly and function improved significantly in both groups (p<0.05); however, there were no significant differences between the groups (p>0.05). Medication use was less in the physiotherapy group than the R.I.C.E. only group. In the acute setting, patient self management using R.I.C.E. is as effective as multimodal physiotherapy treatment in the management of the ankle sprain. Improvements in function scores and reductions in pain and ankle swelling were similar for both groups. These results are consistent with other studies that have investigated the use of R.I.C.E. Hing, W., Lopes, J., Hume, P. A., Reid, D. A. (2011). Comparison of multimodal physiotherapy and "R.I.C.E." self-treatment for early management of ankle sprains. 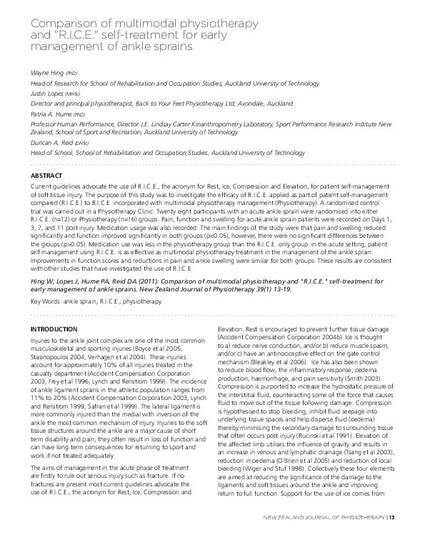 New Zealand journal of physiotherapy. 39(1), 13-19. Access the Journal's home page.